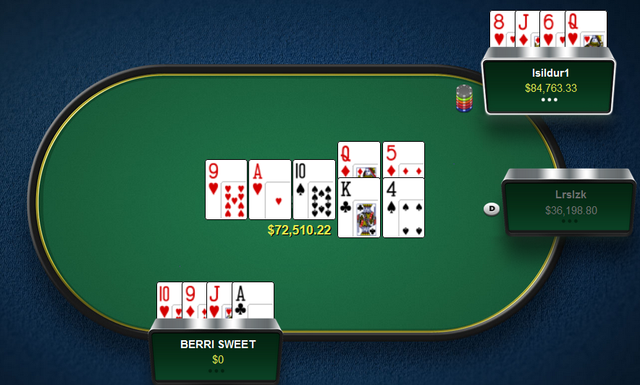 The biggest winner in Sunday's high stakes games was Swedish PLO regular, BERRI SWEET who left the tables with a $95,373 profit after 480 hands of play. BERRI played short sessions at quite a number of $100/$200 tables for 2.5hrs from mid-afternoon gainst the likes of Lrslzk, Isildur1, JayP-AA, fjutekk, Cobus83, and Grazvis1 - winning at 9 of the 12 tables he played at these stakes, although he didn't win anymore than $21k at any single table, it was more a case of winning little and often as he made his way towards his $95.4k score. The biggest pot of the day came from these afternoon $100/$200 PLO sessions, with Isildur1 claiming the honours. Despite winning the day's biggest pot, it was a farily unspectacular day for Isildur1 who played a substantial number of hands of PLO as well as a few at the FLO8 and 8-Game tables for a small profit of $9,858. Second on yesterday's leaderboard was Sami "Lrslzk" Kelopuro who ended the day with a $76,588 score, although at one point he was up over $120k for the day. Although he played in a lot of $100/$200 PLO games, his profit actually came from a 2hr 20min heads-up session of $1k/$2k 8-Game against Chun Lei "SamRostan" Zhou yesterday afternoon which garnered Kelopuro $84,530. After suffering a very bad couple of months where he lost around $900k, Lrslzk has now won over $300k in the past few days. In third place we find Dutch pro Ravenswood13 who earned $46,576 from just over 1.3k hands split between the 8-Game, FLO8, and PLO tables, and Mikael "ChaoRen610" Thuritz took fourth place with a +$36,269 day, with all his winnings coming from a few tables of 6max $50/$100 PLO. For all yesterday's winners go to our results page, or to check out the current action head on over to the live results section.